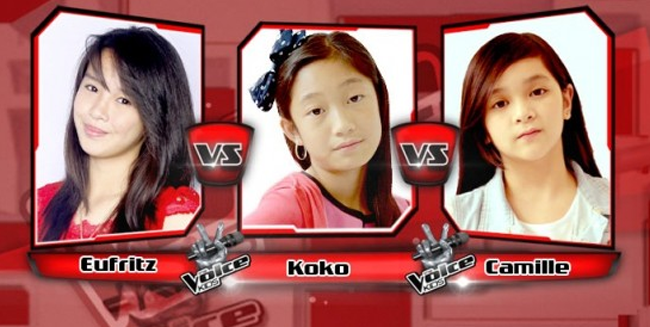 The 2nd group that competed on Team Lea was composed by Eufritz, Koko and Camille. This was a very interesting battle with an unexpected result. Well, the three were good looking and they were best friends. According to Coach Lea, they can be supportive with each other and that was a good aspect of the competition. The three performed “Love Song” and Coach Lea had a way of conditioning their minds so that they can perform well on stage. She said that they need to think about their “crush” or any guy they would like to dedicate the song with. She told them to look at the yellow chair in front of them and think of someone sitting there and they were dedicating the song. During the rehearsal, there were corrections given to them by their coach especially to Eufritz who often forgot to consider the floor. The two had a great performance during the rehearsals and it was Eufritz whom Lea spent her time developing especially on the gestures. On the performance proper, the three coaches listened attentively to each and every note they tried to reach and also enjoyed on their performance. The song was started by Koko, followed by Camille then lastly, Eufritz. One of the things that took place in their performance is that Koko bumped with Camille that made Coach Bamboo laugh. After the performance, the three coaches will have to give their opinions and choice. Coach Sarah considered Eufritz as the one who enjoyed the performance the most and so she picked her. Coach Bamboo picked Camille because of her sweet voice and consistency. Coach Lea, made the official decision of saving Eufritz to advance on the next round. It was an unexpected performance for Eufritz who had a lot of corrections during the rehearsals. It only shows that she really internalized what her coach told her.